A Change in Time for Christmas? TLDR: A wide range of weather is possible today through the weekend. Scattered showers will be in the area today and tomorrow, with a high pressure ridge building in for the second half of the week. Our next storm chances appear to be next weekend. Short term (Today – Wednesday): This morning, a sharp rise in surface temperatures allowed for the inversion to quickly mix out and disperse the pollution that was previously trapped in the valley. Current air quality is not perfect, but definitely an improvement from yesterday. 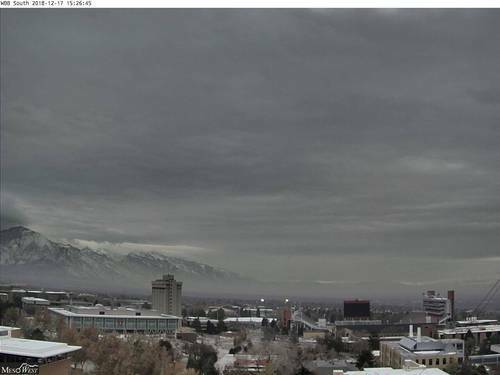 Today, cloudy skies and light scattered showers have been prevalent across the Salt Lake Valley and central Wasatch. Through the overnight hours, scattered valley showers may linger, but snowfall accumulations in the mountains appear to be unlikely. A trace to half an inch is all that is expected through tomorrow morning. A second shortwave will cross the northern Rockies and impact the area tomorrow evening. Valley rain showers and some high elevation snow is likely. Given slightly more moisture associated with this storm, precipitation totals could be higher than what is expected through tonight. High elevations in the central and northern Wasatch (Cottonwoods, Odgen, etc.) could see additional snow accumulations of 2-4″ through Wednesday night. Details on this forecast will be refined tomorrow and Wednesday. 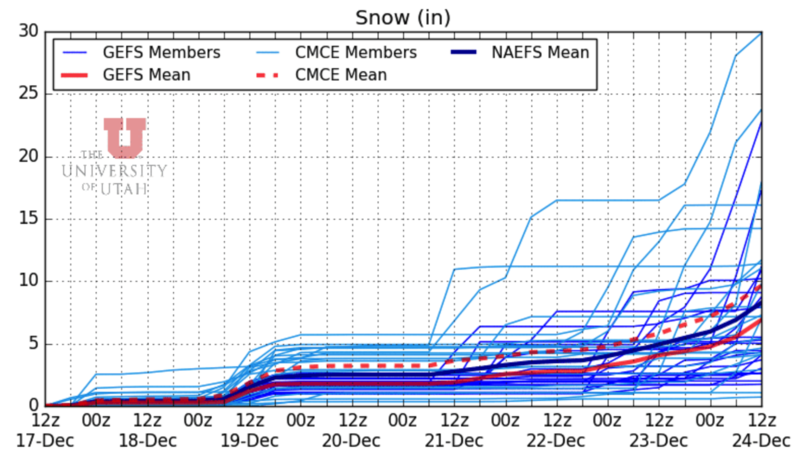 Snowfall forecast from the NAEFS members are shown below. This also includes the snow total forecasts for our potential storm on Saturday. After our second trough moves through the area on Wednesday, a ridge will take hold, with high pressure centered over the Intermountain West. This will create a dreaded inversion, which will inevitably trap pollutants and make air quality sub-optimal in the Salt Lake valley. 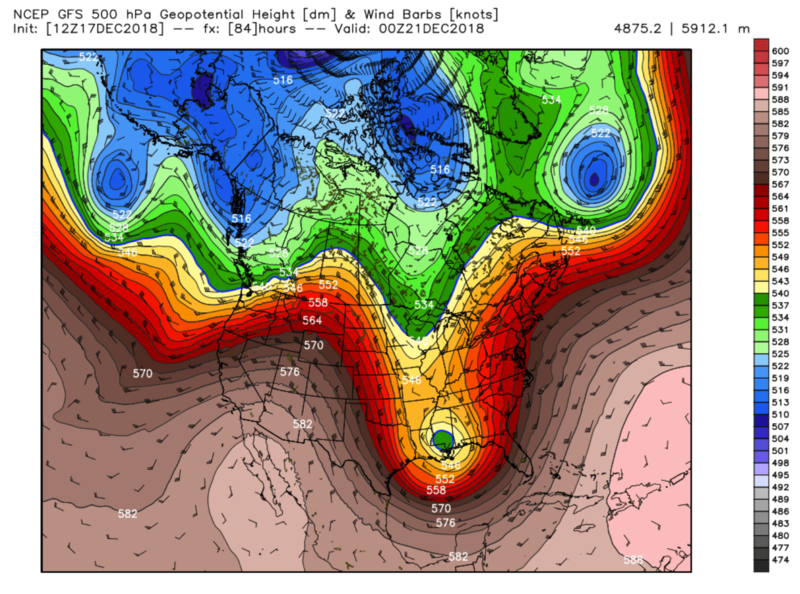 The plot below shows the mid-level ridge that will be creating these conditions (Upside-down “U” shape over Utah). Saturday is our next real shot at not only fresh snow, but a frontal passage that will clear the pollution from the valley. More details on this as the weekend gets closer and models converge on timing and other details. Next Next post: Let’s just make it to Friday!